One of TRADE’s priorities – and strengths – is that researchers have the opportunity to attend training at regular intervals to ensure that they are up to speed with the latest developments and thinking in their particular areas of focus. Ms Michelle Groenewald and Mr Caro Janse van Rensburg, both completing their Master’s studies at TRADE, attended the LSE-UCT Winter School (convened by the London School of Economics and the University of Cape Town) in June and July 2016 where the focus was on poverty and development, and how the research profession can shine more light on the complex relationship between these two phenomena. Then, in August 2016, the NWU School of Economics Winter School took place, a compulsory programme for MCom International Trade and Economics students, which is designed to stimulate advanced conceptual thinking and robust debate with a view to enhancing these postgraduate students’ research efforts and outputs. For more information about our Master’s and PhD programmes, click here. September 2016 saw Prof Lucas Ferraz from the São Paulo School of Economics in Brazil (and a WTO Chair holder) visit the NWU and conduct an introductory training course for a group of staff and postgraduate students on the use of the GTAP (Global Trade Analysis Project) database for conducting quantitative analyses of international economic policy issues, especially trade policy. 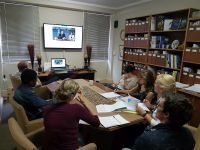 In October and November 2016, Prof Henri Bezuidenhout participated in two international training courses on cross-cultural issues, in line with his growing interest in that field. The October course in Cultural Intelligence took place at the Cultural Intelligence Center in Los Angeles in the United States. Having successfully completed this course, Prof Bezuidenhout can now use the designation ‘CQ-Certified Advanced’ after his name (one of the few people in South Africa to have earned the right to do so). The November course on Cross-Cultural Competency was conducted by the prestigious Richard Lewis Communications and Cross Culture Centre in Riversdown, England. Another interesting training opportunity came in the form of a trade policy analysis course held in November 2016 in Dakar, Senegal. Attended by Ms Lorraine Ferreira, one of TRADE’s PhD students, the course was hosted by the African Institute for Economic Development and Planning and the African Trade Policy Centre, and focused on the application of gravity and computable general equilibrium models using STATA and GAMS software packages.